When families need to retrofit or redesign areas of their home to accommodate a disabled family member, the first things that come to mind are usually aspects of the home that make it easier to navigate the spaces within and around it. Ramps for wheelchairs, bathroom modifications and bedroom modifications are usually at the top of the list. Just as important, however, is installing lights, outlets and switches for the disabled. Not only is it important to make sure that the disabled family member has an easy time seeing where they are going at night, but switches and plugs need to be easy to reach and use as well. It’s also very important that if you have a disabled family member living with you, or you are retrofitting a home to be ADA compliant, that you call on help from a residential electrician who understands the latest codes and requirements and can safely accommodate you and your loved one. Root Electric’s team has a lot of experience doing exactly this type of work. Bathing a room in even light is important, and so is reducing the glare to cut down on vision difficulties. When we install lighting to help families with disabled members, we usually recommend and install frosted, surface-mount fixtures that cast light evenly around the room without creating headache-inducing glare. This ensures that the rooms are well lighted for easy visibility of all areas. 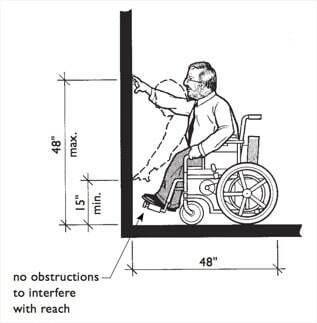 This also makes it easier for people in wheelchairs, or with other mobility issues to see properly so they can navigate your home. In rooms that do not get much natural sunlight from windows, full-spectrum lighting that reduces the yellow wavelength of light and gives a closer approximation to natural sunlight are often recommended. So we often suggest full-spectrum light bulbs when installing lights for the disabled. Studies show that the more full-spectrum and natural light people get, the better their moods will be, which is very important for both the disabled and their family members and caregivers. So if your loved one’s room doesn’t get sufficient natural light already, be sure to replicate sunlight with the proper electric version as much as possible. 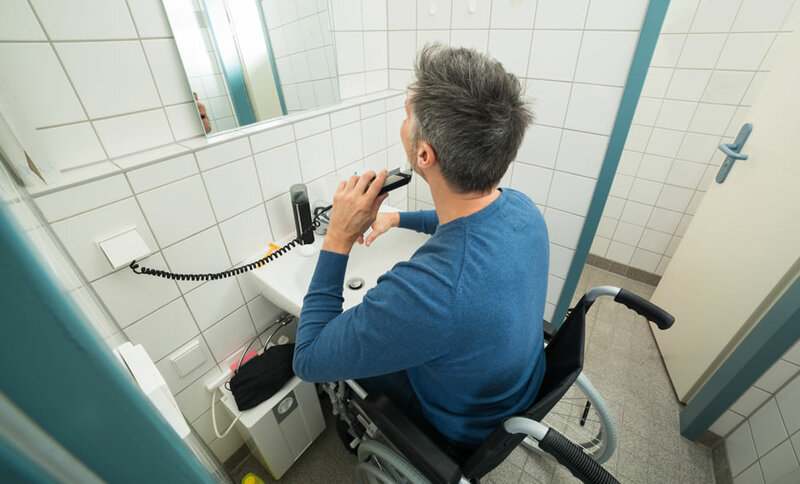 One of the most important code requirements when updating your home for a disabled family member is to make sure that all of the light switches are within easy reach, particularly for those who may be in a wheelchair. Switches should also be easy to use. Typical toggle switches may be harder to grasp. Round dimmer switches are also difficult. So consider having your residential electrician install rocker or touch-sensitive switches instead, or dimmer switches that have handles. Remote controls are also a great option that gives the disabled more control over their surroundings. Retrofitting switches and outlets for ease of use is critical for your family member’s safety, convenience and sense of independence. 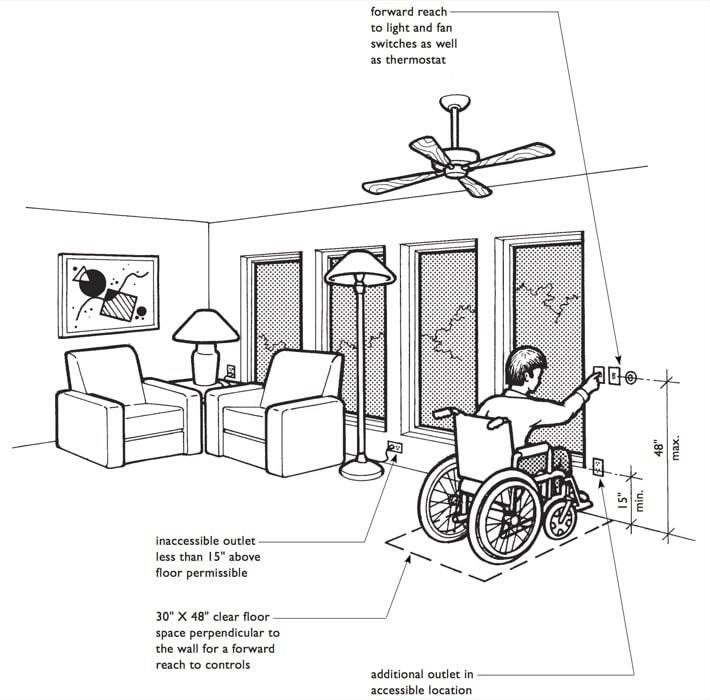 It’s also a requirement for newer housing codes to ensure that electrical outlets, light switches, thermostat switches, heating, AC and ceiling fan switches are optimally placed for easy reach from wheelchairs. The following image was originally published by the U.S. Department of Housing and Urban Development, Office of Policy Development and Research, and is reproduced here with the Department's permission. Many conventionally-placed electrical outlets are very difficult for those with disabilities to safely reach and use. This is particularly true in areas where outlets and switches may be along the walls behind countertops. It is important that any space used by your family member have safe, updated, easy-to-reach outlets available to them at all times. Our residential electricians can install new outlets that will fit with ADA requirements and give your loved one the convenience and safety they need to get around and charge their gadgets and other electrical devices easily. Appliance controls that connect to easy-to-reach switches and remote controls are essential, and required under the ADA for climate control systems such as air conditioning, heating, ceiling fans and lighting. The ADA does not list requirements for appliance controls for the disabled, however. But if you are accommodating a family member with disabilities, you’ll very likely want to look into installing accessible appliances or easy-to-use controls that enable your family member to use appliances safely and easily. Appliance manufacturers have developed everything from refrigerators, ovens and dishwashers to washers, dryers and microwaves to be accessible to those in a sitting position. Keep in mind that installing ADA-compliant outlets, switches and remote-control systems are not do-it-yourself projects, especially in older homes that may have outdated or aluminum wiring issues. To update plugs, switches and other electrical systems to comply with the ADA and help your family member enjoy an easier, more independent lifestyle, Call our Root Electric residential electricians to go around your home with you and evaluate switch and outlet placement from the perspective of your disabled friend or family member. We can create a very detailed plan of how to replace and move switches and outlets safely to make it easier for your family member and caregivers to access lighting, climate control and power when they need it. There are many other aspects of installing lights for the disabled that we can help you with also. We can suggest areas of the home where motion-sensing lights and nightlights (especially outdoors and in hallways and bathrooms) could be helpful. The bottom line, when installing any lighting for any family is safety, and our expert residential electricians are sticklers for safety at all times. So don’t go it alone: call us at 703-494-3989. We will be happy to come out and advise you on the best lighting solutions to help your disabled family member and their caregivers stay safe, secure and independent.